HEALTHCAREfirst, a home health care and hospice SaaS provider, approached Unidev regarding a holistic digital marketing solution including site optimization, traffic improvement, and lead generation. The focus was on generating more qualified leads. Increase organic traffic through strategic on-page search engine optimization strategy. Acquire targeted leads and new business, particularly from the Google Ads (formerly Google AdWords) and Bing Ads advertising platforms while minimizing unqualified leads (such as interested job applicants). A holistic site audit to specifically address technical SEO elements. A thorough review of existing Google Analytics and Google Tag Manager setup, pathways, user behavior, and goal tracking. Ensuring their existing CRM (Magento and then a Pardot migration) correctly tracked website leads to identify which campaigns sent not only the most leads, but the most qualified leads. A complete overhaul of the existing PPC campaigns, which included account structure optimization, new keywords, negative keywords, new ads, ad copy extensions, as well as identifying budget bottlenecks for core products and analyzing competitor behavior to ensure that HEALTHCAREfirst was competitive with other SaaS providers in their industry. Ongoing monitoring and adjustments to continuously increase clickthrough rate and decrease cost per lead. Some wins come easy while others take serious attention to detail and strategy. In this scenario, the result was a combination of both. The gains in this approach were largely thanks to tactical implementation and execution. As a collaborative initiative with the client, ongoing communication was the cornerstone to success. 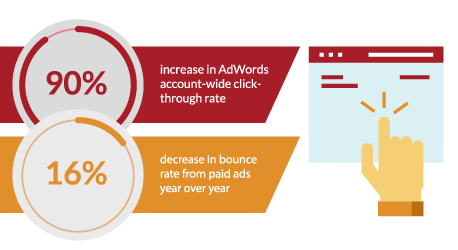 A 90% increase in Google Ads account-wide clickthrough rate and a 16% decrease in bounce rate from paid ads year over year. A 31% increase in new website sessions from paid ads by blocking existing customers from the impression pool. A 13% increase in the number of branded keyword clickthroughs when users were presented with a Google search results page that had both a paid ad and organic listings vs. just organic listings. A substantial increase in qualified leads from pay-per-click channels on the new landing page (leads particularly interested in the home health and hospice software offered by the client). The next step is to begin remarketing to target the most relevant audience possible. To find out how Unidev can assist your organization with Digital Marketing, contact us today.